See, Maggie-sensei can write any 漢字 ( = kanjis) without any problems! It means “wonderful” or “impressive” “admirable” as people expected. 「さすが！」( = Sasuga!) or「さすがですね！」( = Sasuga desune!) ”You are great!” as a compliment. The implication is that you are not surprised they did a good job, because they often do a good job. You are impressed, but you also expected them to do well. In your mind, they have a good track record. When you put it in front of adjective, it makes it more powerful. = Sasuga ni sugoi desune. It is one of the many difficult words to translate from Japanese to English. Let’s look at some more examples. As you see Maggie wrote difficult kanji on the board. 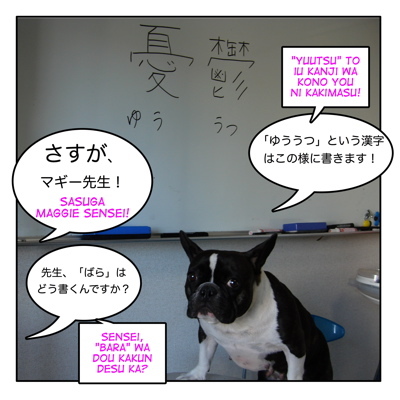 It implies you knew Maggie is a great teacher but still you are impressed with her ability to write difficult kanji. = Sasuga, Sekai ichi no pianisuto to iwareru dake atte kare no ensou wa subarashii. ♦さすが〜だけ（のことは）ある(=sasuga ~ dake (no koto wa) aru.) : As might be expected, Only ~ could have done this great job. = Sasuga puro dake atte kanojyo wa tsuyoi. = (Since she is a pro) we had expected, she would be strong! = Sasuga okaasan ryouri umai ne! = Odatete mo muda desuyo. Ex. ３ ) If you use it in a negative sentence, it means “even”. = Sasuga no Maggie-sensei demo machigaerun dane. = Shitsurei na okyaku no taido ni sasugani itsumo teinei na tenchou mo koe wo aradateta. Even the store manager — who is usually polite — raised his voice to a customer who had become rude. = Sasuga no kare demo okusan wa kowai. = Even he is scared of his wife. = Sasuga ni kyou wa tsukareta ne. =Sasuga Katou san, Jouzu dane. = Ie, zenzen umaku nai desu. in a very humble way. OK, now let’s take a look at the picture above! = ~ wa dono you ni kakimasu ka? = How do you write ~? = ~ wa kono you ni kakimasu. = We write ~ this way. Note : 憂鬱 ( = yuu utsu) (melancholy, gloom, depressed feeling) is one of the difficult 漢字 ( = kanji) that I bet many Japanese people can’t write. ばら（バラ）rose is considered to be one of the most difficult 漢字 ( = kanji). Do you want to try to write it? = Hai sasuga dato omoimasu. = Yes, I think you’re great! *raises a hand*I have a question sensei!! so an average Japanese person, how many kanjis would they know? Well, I just checked it. We are supposed to know at least 1600 kanji by the time when we graduate from junior high school and almost 400 more kanji for high school students. So more or less 2500 kanji you should know, I think. But it doesn’t mean we all can write kanji. You are right. Since we depend on computer or cellphones too much when we write, we don’t and we tend to forget how to write them. We have a couple of games shows on TV where people compete the knowledge of Kanji. It’s crazy! You will laugh! OK, I will tweet you about 方 later! Don’t worry! We can read them but if we have to write them, our heads would explode as well! The more we use a computer or a word processor, the more we forget kanjis. So that is why Maggie-sensei is GREAT! There are a couple of popular quiz shows where people compete to read or write kanjis in Japan. 「ヘキサゴン」（=Hexagon) is one of them. You will be surprised to see many of おバカタレント (=Obaka tarento) (a kind of cute way to call “stupid TV personalities” can’t read even easy kanjis. And it is a fun program!